Daily Illuminator: New Magic, Personal Dimensions, More Worlds: It Must Be Pyramid! 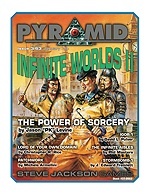 January 28, 2014: New Magic, Personal Dimensions, More Worlds: It Must Be Pyramid! There's one thing explorers of the limitless cosmos agree on: It has something for everyone. The just-released Pyramid #3/63: Infinite Worlds II continues this tradition by unleashing the boundless power of the alternate realities. With this tome, you can tinker with Jason "PK" Levine's new GURPS advantage-based magic system, or use the new GURPS Psionic Powers expansion to carve out your own pocket dimension and really get away from it all. You'll also get three new alternate timelines to explore, including David L. Pulver's weird-science-tinged look at WWII, and a setting whose scientists seek to harness the power of Banestorms. If getting lost in some shopping is more your speed, then Phil Masters' "Infinite Aisles" offers a cross-dimensional twist that melds world-hopping with mall-hopping. Now is the time to book your out-of-this-world adventure or sign up to test strange new abilities! Grab Pyramid #3/63: Infinite Worlds II individually, or start your subscription today for many more months of suitcase-packed possibilities.